More easily referred to as HCM, this disease is a thickening of the heart muscle, and is believed to be largely genetic in origin, with several breeds considered suspect. It is found most often in middle-aged cats, and in males. Although there is no known cure for this condition, with prompt diagnosis and early treatment, cats may live on for years after diagnosis. HCM is often associated with Hyperthyroidism in cats. Congestive Heart Failure (CHF)sometimes results from HCM. Clinical symptoms include a heart murmur or a pulse over 200. Further tests would then be needed. Other symptoms may also present. 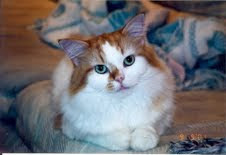 A reader who lost her cat to HCM following surgery wrote me: I have since found out that it can be very hard to diagnose heart problems in cats because they compensate so well by limiting their activity. However, sitting upright or seeming reluctant to lie down are classic signs of fluid building up in the lungs as the heart starts to actually fail. These postures help keep the fluid away from the heart and the top of the lungs. Other signs of heart failure can include lethargy, lack of appetite, coughing, gagging, or labored, rapid, or very shallow breathing. If a blood clot forms, the clot can get lodged in an artery leading to the hind legs and cause paralysis as well as a lot of pain. May show enlargement of the heart or a "valentine shape" of the heart sometimes seen with HCM. May show several patterns distinctive with HCM. Often used to confirm or enhance other findings. Elevated values may reflect systemic arterial hypertension or hyperthyroidism. For a more complete explanation of these tests, read the excellent article at Max's House. Beta Blockers: atenolol and metoprolol. These drugs help improve the "filling" function of the left ventricle, which will subsequently increase the volume of blood flowing to the lungs, helping to decrease pulmonary edema. Calcium Channel Blockers : diltiazem. Also help improve heart function, by reducing heart rate and myocardial oxygen consumption. Ongoing clinical trials with cats seem to indicate that these drugs may work better than Beta Blockers, for improving heart function. Diuretics: Help to reduce pulmonary edema. Because of the potential for negative side effects. renal function must be monitored carefully when diuretics are used. This profile refers to Hypertrophic Cardiomyopathy (sometimes known as Idiopathic HCM. )Another type of cardiomyopathy is Dilated Cardiomyopathy, which is related to insufficient taurine in the diet. Fortunately, all cat food manufacturers supplement their foods with taurine, so this disease is becoming rarer. A third condition, Restrictive/Intermediate Cardiomyopathy, mimics HCM in history and examination, but can be differentiated with echocardiography. Unfortunately, its prognosis is poor. 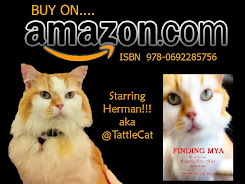 Each cat carries his own history, and it is impossible to predict the prognosis of any cat with HCM. However, existing technology offers the possibility of several more months to several years with current therapy, and depending on the overall condition of the cat at diagnosis. A dedicated cat caregiver and companion can help by working closely with her veterinarian, and by providing a warm, stress-free environment for her cat. Awesome interview, and I am so happy you posted this now because I have a friend who is worried about her cat losing weight. I'm going to suggest this article to her!